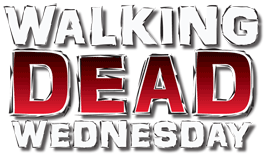 Walking Dead Wednesday is having a little crisis of identity. None of the Walking Dead Mystery Minis are given any kind of identifying information, but most of them are fairly recognizable. Bicycle Girl, Well Zombie, RV Walker... everybody just seems to know what names to call them. This guy, however, seems to have fans split between One-Eyed Zombie and Eyeless Zombie - but everyone is missing the most obvious name there is. 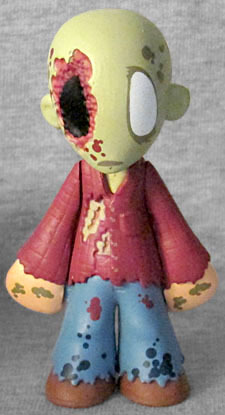 This zombie did appear on the show - in the penultimate episode of Season 3, "This Sorrowful Life." And yes, this is exactly how he looked, with the skin on the right side of his face torn away, and deep wounds visible through the tears in his shirt. His plaid shirt. His red plaid shirt. This Walking Dead zombie is a direct homage, in costume and in makeup, to the "Plaid Shirt Zombie" from George Romero's classic Dawn of the Dead! The sculpt is impressively detailed for something this small and simple. The lower edges of his pants and shirt are tattered, and the torn-out sections are deep. There's a pocket on his left breast, and there are straight lines etched on the torso and arms to suggest the plaid pattern of the shirt. As mentioned, he only has one eye - his right eye is a black pit surrounded by ragged red flesh (and there's another spot of it under his jaw). This is the first WD Mystery Mini walker to not get the "missing lips" zombie signifier. His head is painted with the typical sickly green color, but his hands are still "human" pink. That seems like an error, but the Dawn of the Dead zombie had hands that were lighter than its face, so maybe that was an intentional homage? His hands and legs have lots of dark splatters. In addition to the 1:12 standard release, there's also a glow-in-the-dark version that's packed 1:24. At least on that one the hands match the rest of the body.